Tariffs might not be the most interesting topic, but it’s certainly timely (you might remember that I recently wrote about the trade war). No matter how much I know or continue to read about tariffs, it’s a complex topic and I’m always learning more. I found the article included below to be a clear and helpful resource. 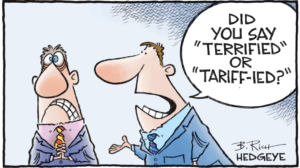 Even if you’re a tariff expert – and I know some of you are! – you might enjoy sharing it with others. Tariffs: just a big ol’ government money grab. It’s easy to forget that a tariff is just another type of tax. Many people haven’t considered tariffs in this light. (Probably because most people don’t spend their free time musing about tariffs. Yeah – I’m a little strange.) A tariff is a type of tax imposed and collected by the government, placed on a specific imported or exported good. Tariffs remind me of the so called “sin taxes” placed on cigarettes, alcohol, and, in some states I won’t embarrass by naming, sugary drinks. These are simply additional taxes to produce revenue for the government, under the guise of helping. The government officials who create these sin taxes claim, “If we make cigarettes more expensive, people will smoke less.” Sure, maybe a little bit – but it is really just another way to create more revenue. And who is going to argue against it? Opponents look like the bad guy if they say, “No, we would like to keep cigarettes inexpensive so more people can die from lung cancer.” That doesn’t sound good in the 10-second sound bites played on the news. Research isn’t conclusive on whether these “sin taxes” have a positive or negative effect; some data shows that they may have short-term benefits but long-term consequences. Not all tariffs function like sin taxes, but in general, both sin taxes and tariffs are taxes paid to the government. The loser in this equation is unfortunately the American consumer and the grand winner is always the government, who gets to put more money in its pocket. Check out the article below to learn more about what a tariff is and how the effects of tariffs vary in different countries, depending on the country’s ability to influence world market prices. As you will read, tariffs were one of the only ways to collect taxes prior to ratifying the 16th Amendment in 1913, which allowed the government to collect income taxes from its citizens. I’d say the government has quite a few other ways to collect money from taxpayers these days.